Leukemia is a cancer of the blood. It involves production of abnormal and immature blood cells by the bone marrow. These cells are incapable of performing normal function. As the number of abnormal cells grows, they crowd in the bone marrow and the bloodstream, which prevents the normal blood cells from functioning effectively. Depending on the rate of progression of the disease, leukemia is divided into acute and chronic. Let us understand the difference between the acute and chronic forms of the disease. In acute leukemia, the abnormal disease cells are produced at a rapid rate in the bone marrow. They quickly enter into the bloodstream and reach other distant organs of the body. Here they collect and affect the normal functioning of the organ, causing a variety of complications. An increased number of immature blood cells in the bloodstream prevents the normal cells from functioning properly, giving rise to symptoms such as anemia, chronic fatigue, decreased immunity, etc. Acute Lymphocytic Leukemia: This is also known as acute lymphoblastic leukemia or acute lymphoid leukemia. This is a fast-growing form of blood cancer in which there is an increase in the number of abnormal white blood cells in the bone marrow. These cells spill into the bloodstream and can spread to vital organs such as brain, liver, and testes. The abnormal white blood cells are immature and are ineffective in carrying out their function. The disease is more common in children below 15 years of age and in adults above 45 years of age. 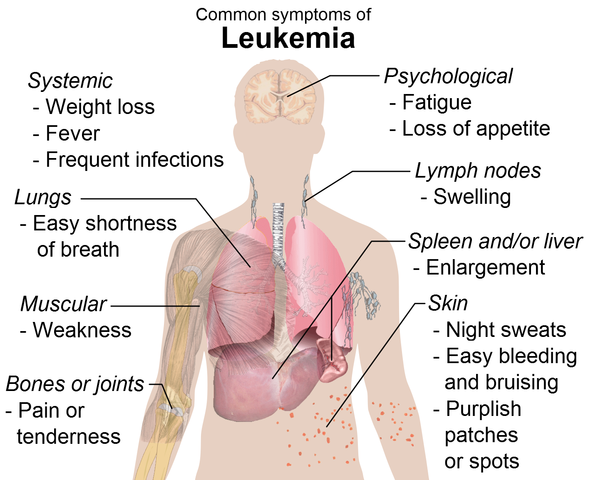 Acute Myeloid Leukemia: This is also known as acute myelogenous leukemia, acute myeloblastic leukemia, acute granulocytic leukemia, or acute non-lymphocytic leukemia. This is the most common form of acute leukemia in which the bone marrow produces abnormal blast cells. Blast cells are the immature cells from which the mature cells – like red blood cells, platelets, and white blood cells – are formed. The immature blast cells never mature into WBCs, RBCs, or platelets. AML has eight subtypes depending on the type of cell affected. In chronic leukemia, the abnormal cells are produced at a very slow rate; and so it takes a long time for the disease to progress and develop complications. Since there are more normal cells as compared to abnormal cells in the bone marrow and bloodstream, the core functions of the blood are still carried out. There are two main types of chronic leukemia: Chronic Lymphocytic Leukemia and Chronic Myeloid Leukemia. Chronic Lymphocytic Leukemia: This is a slow-growing form of cancer, which begins in the infection-fighting lymphocyte cells of the bone marrow. As the number of abnormal cells grows, they spread into the bloodstream and reach distant organs such as lymph nodes, spleen, and liver. Increase in the number of abnormal cells hampers the function of the normal lymphocytes, which in turn reduces the body’s capacity for fighting against any type of infection. This form of cancer mostly affects adults above 55 years of age. It is never seen in children or young adults. Chronic Myeloid Leukemia: This is also known as chronic myelogenous leukemia. It is associated with a chromosomal abnormality – the presence of Philadelphia chromosome. This chromosome produces cancer genes and accounts for around 10%-15% of the chronic leukemias. This form of blood cancer also affects mainly the elderly population, with the average age of affliction being around 67 years. As the disease affects the functioning of normal RBCs, WBCs, lymphocytes, and platelets, the symptoms include recurrent episodes of infection with fever due to reduced immunity, anemia, paleness, constant weakness and fatigue due to reduced oxygen-carrying capacity of the blood, easy bruising, prolonged bleeding, delayed blood clotting due to decrease in number of healthy platelets, reduced appetite, loss of weight, etc. The cancer also causes swelling of lymph nodes, liver, and spleen. As the disease spreads to other organ systems, organ-specific symptoms arise. Treatment of leukemia is a combination of chemotherapy, radiation therapy, immunotherapy, and stem-cells transplant. To summarize the main difference between acute and chronic leukemia is attributed to the rate of progression of the disease. Maitreyi Naigaonkar. "Difference Between Acute and Chronic Leukemia." DifferenceBetween.net. September 16, 2015 < http://www.differencebetween.net/science/health/difference-between-acute-and-chronic-leukemia/ >.